One winner will be chosen from all entries. In addition, one runner-up will be chosen from each of the other schools, making a total of four winners. 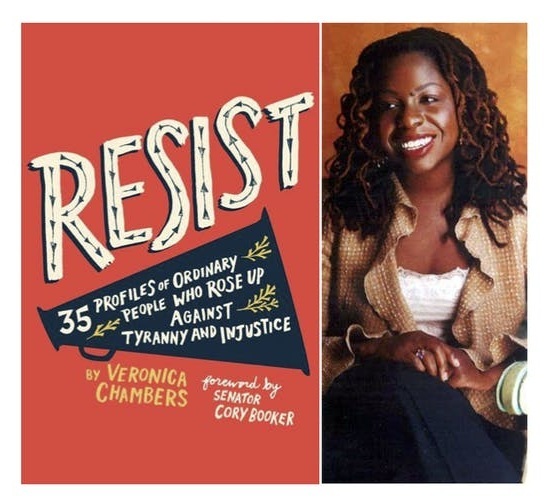 All winner will receive free access to the Homecoming Luncheon where they will be presented by the author of Resist: 35 Profiles of Ordinary People Who Rose Up Against Tyranny and Injustice, Veronica Chambers. They will also receive a free signed copy of her book and a meet and greet. Please read the official Rules and Guidelines before submitting. Veronica Chambers was born in Panama and raised in Brooklyn. She often writes about her Afro-Latina heritage. She speaks, reads, and writes Spanish, but she is truly fluent in Spanglish. As a prolific author, best known for her critically acclaimed memoir, Mama's Girl, which has been course adopted by hundreds of high schools and colleges throughout the country. The New Yorker called Mama's Girl, "a troubling testament to grit and mother love… one of the finest and most evenhanded in the genre in recent years." She coauthored the award-winning memoir Yes Chef with chef Marcus Samuelsson as well as Samuelsson’s young adult memoir Make It Messy, and has collaborated on four New York Times bestsellers, most recently 32 Yolks, which she co-wrote with chef Eric Ripert. She has been a senior editor at the New York Times Magazine, Newsweek, and Glamour.